The "Living Off the Land" approach to hacking is to execute malicious actions from legitimate binaries already installed on the victim's endpoint. There is no need to pack any extra software in the payload baggage to transfer external files: it’s already on the victim’s computer. I compared the Windings font between a lot of Windows versions and the font was exactly the same. $payload = $payload + ", " + $offset + " _`r`n"
The following (crappy) VBA code will use the bytes array we created to generate malicious components. The next steps of the following code is to select Explorer.exe as a parent process for RunDll32.exe (to confuse EDR products ;-)), then will execute the malicious components with RunDll32.exe (a .DLL running a PowerShell beacon from an .ICO resource). You could replace this by injecting memory processes instead of writing files to the disk. The exercise is left to the reader. [...] --> you array of bytes containing the position of necessary bytes in the Windings font. xl = "C:\Users\Public\Documents\changeMyParent.exe ""C:\Windows\system32\RunDll32.exe C:\Users\Public\Documents\runPoshCode.dll,ComputeFmMediaType -f C:\Users\Public\Documents\BEACON.ico"" " & pskafxx = "." I'm a gamer. 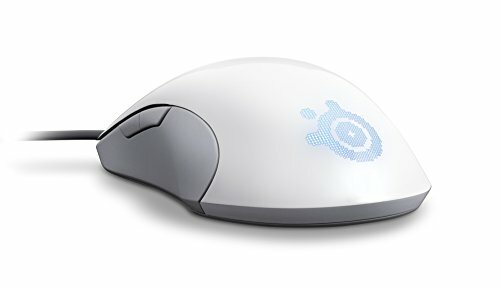 I bought one of the awesome SteelSeries Sensei [RAW] Mouse. 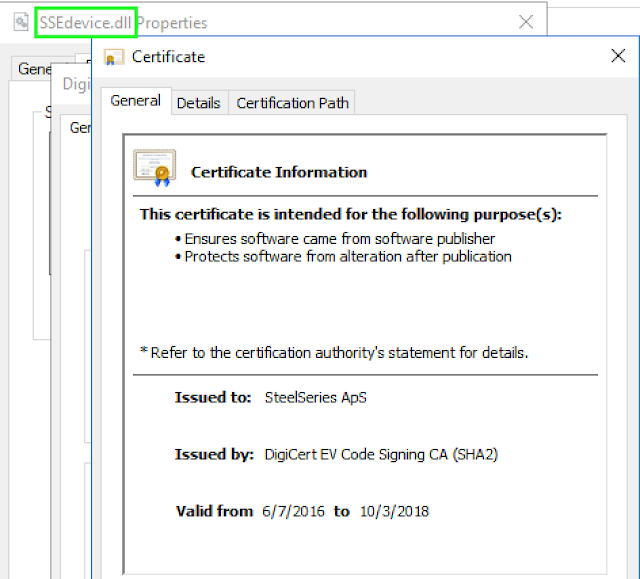 So I looked around the installation of the SteelSeries Engine 3 software which allows to manage your device: "SteelSeries Engine 3 talks directly to your game, which changes your device's illumination in real time, based off of in-game events.". 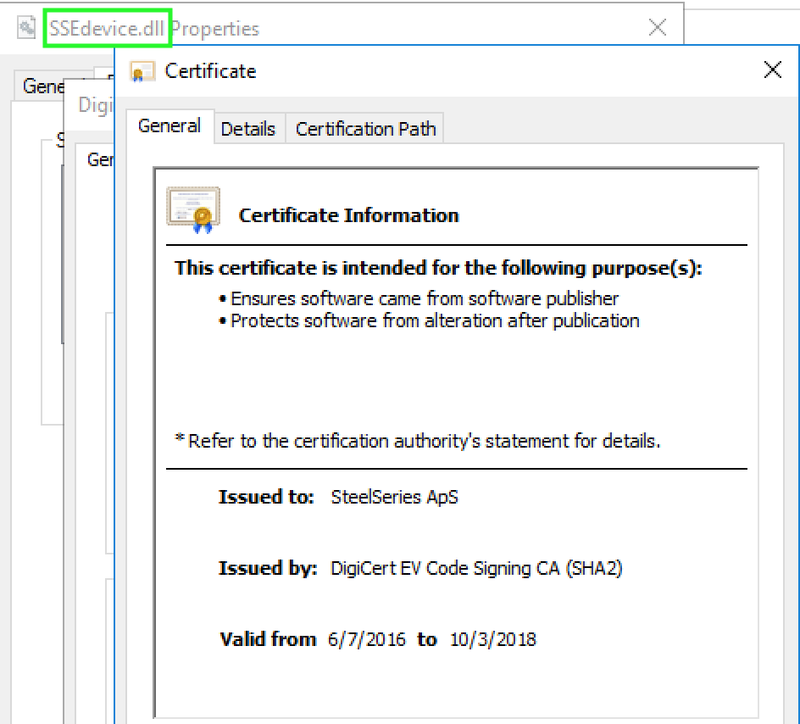 The binary win_driver_installer.exe tried to load SSEdevice.dll which is also signed. I ran again and... bingo I have a beacon! A while ago, when working on PowerMemory, I discovered a hidden account configured by Nvidia on one of my computers (https://twitter.com/pabraeken/status/651369704746020864). I started looking for other similar binaries developed by Nvidia that could execute system commands with the legitimacy of Nvidia. "AddUninstall, Call, CheckPath, CheckRAID, ClassSweep, Copy, CopyV, CreateDevice, CreateShortcut, Del, DelBoot, DelBootQuiet, DelIniIfMatched, DelOemInfs, DelReg, DelRegE, DirAndApply, Echo, EnumDevices, EnumRegCmd, EnumRegNamesCmd, Eval, FindOEMInf, GetDrivePort, GetFolderPath, GetInfGUID, GetReg, Help, If, InstallDriver, InstallDriverEx, KillApp, RemoveDevice, Run, RunOnce, SendMessage, Set, SetEnv, SetReg, Sleep, Splash, StartLogging, StopLogging, SysCallAndWait, System, UnifyUninst, Uninstall, UnInstallEx, UninstallGUI, UninstallService, WaitOnRegDel"
"Decrement Increment DisplayControlPanel AskToCloseAndExitIfRunning RemoveDriverStore RemoveDeviceEx DisableDevice RemoveUpperFilter StopService RmString DelAll"
Decrement: Decrements a variable numerically. Increment: Increments a variable numerically. DisplayControlPanel: Displays message about Display Control Panel uninstall. AskToCloseAndExitIfRunning: Given an application name, enumerates all running application for a match. If found, prompts the user to close the application. RemoveDriverStore: Remove any device matched with the given description from the system using setupdi calls. Enum can be (PCI, EISA, etc), HWID usually is VEN_10DE and device type can be DISPLAY, HDC, MEDIA, NET, SYSTEM. 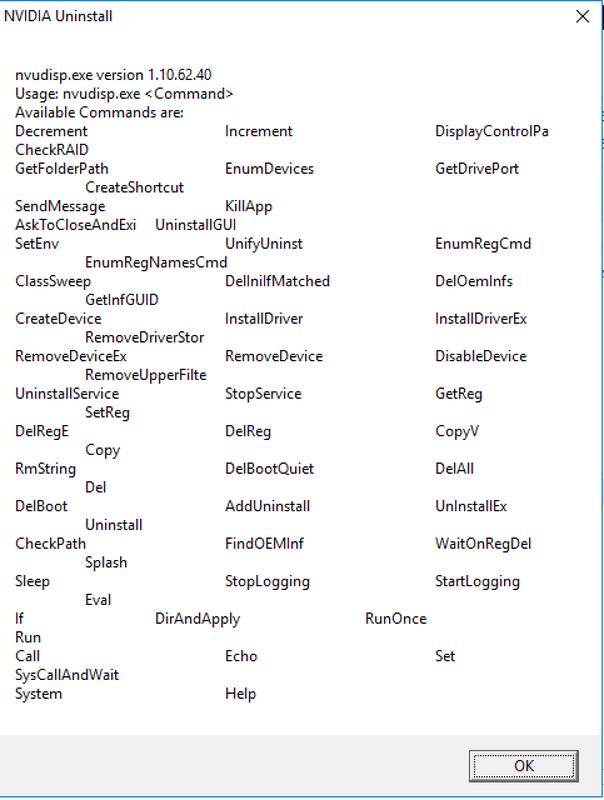 RemoveDeviceEx: Remove any device matched with the given description from the system using setupdi calls. Enum can be (PCI, EISA, etc), HWID usually is VEN_10DE and device type can be DISPLAY, HDC, MEDIA, NET, SYSTEM. DisableDevice: Disable any device matched with the given description from the system using setupdi calls. Enum can be (PCI, EISA, etc), HWID usually is VEN_10DE and device type can be DISPLAY, HDC, MEDIA, NET, SYSTEM. RemoveUpperFilter: Remove filter service from any devices that specify it. StopService: Uninstalls the given service name. RmString: Removes the string from the original string of words if found and saves the result in new variable. DelAll: Delete the given folder if it exists, it also deletes the contents within the folder. Dumping the manifest shows us that the file requires Administrator privileges (exactly like the binaries nvuhda.exe and nvuhda6.exe described by Hexacorn). This is a promising avenue to explore and could be used by real attackers to break standard EDR detection rules. Based on this very good article (http://www.di-mgt.com.au/rsa_alg.html), I have implemented a RSA algorithm. Caution : I did it for fun. 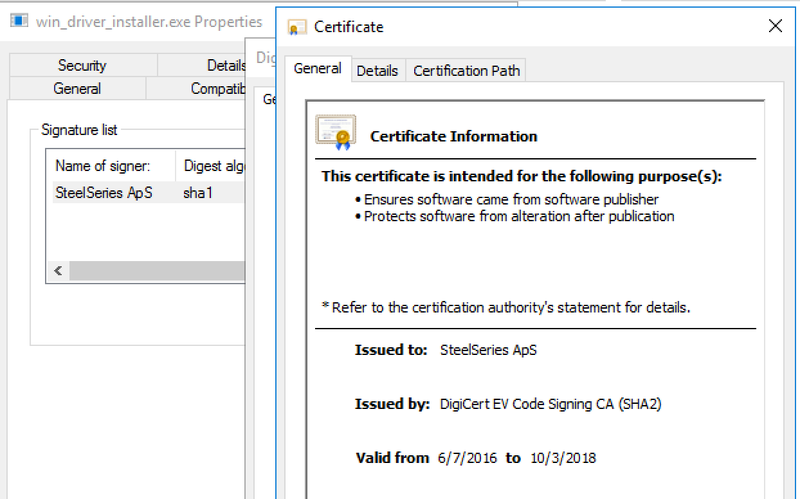 Don't use it in production ;-) For the demo, I encrypt directly the data, in the real world, you encrypt the symetric key (which you exchange between Sender and Recipient) that will encrypt the data. "This is the original algorithm. Generate two large random primes, p and q, of approximately equal size such that their product n = pq is of the required bit length, e.g. 1024 bits. Compute n = pq and (phi) φ = (p-1)(q-1). Choose an integer e, 1 < e < phi, such that gcd(e, phi) = 1. Compute the secret exponent d, 1 < d < phi, such that ed ≡ 1 (mod phi). n is known as the modulus. e is known as the public exponent or encryption exponent or just the exponent. d is known as the secret exponent or decryption exponent." We choose 65537 or 10001 in Hex for e Exponent Public Key(why ? In practice, common choices for e are 3, 5, 17, 257 and 65537 (216+1). These particular values are chosen because they are primes and make the modular exponentiation operation faster, having only two bits of value 1. Aside: These five numbers are the first five Fermat numbers, referred to as F0 to F4, where Fx=2^(2^x)+1. Just be careful, these first five Fermat numbers are prime ("Fermat primes"), but the numbers F5 and above are not prime. For example, F5 = 4294967297 = 641 × 6700417. Obtains the recipient B's public key (n, e). Represents the plaintext message as a positive integer m, 1 < m < n [see note 4]. Computes the ciphertext c = me mod n.
Sends the ciphertext c to B." With the public key (which is composed of the Modulus and the Public Exponent), I encrypt the data string provided. Uses his private key (n, d) to compute m = cd mod n.
Extracts the plaintext from the message representative m."
With the private key (which is composed of the Modulus and the Private Exponent), I decrypt the data string provided. Here's a little PowerShell script to retrieve from the registry the username, Logon Date, Password Last Set and Creation date of the local users on a windows computer. Throw "Cannot open or locate $SubKey on $Computername"